Pork Menudo Pie ~ I Can Do That! I suddenly was craving for savory pie earlier today. I have pie dough already divided into very small disks in the refrigerator and with some leftover pork menudo, I baked a few small pies. Pork menudo and buttery crust, it's so good! In a medium saucepan, heat olive oil, add garlic and onion, stir fry for 2 minutes. Add red bell pepper, and pork. Stir fry for 3 minutes. Add tomato, salt, black pepper, and water. Bring to a boil, cover and simmer for 30 minutes. Add potatoes, simmer for 5 minutes. Mixture should be thick and saucy. Add cooked pork liver, if using, and peas and cook 2 minutes until peas are heated through. Serve with rice, in pan de sal. Or bake them in flaky pie shells. Cusinera, piling the menudo on pandesal gave me the idea of baking it in a pie which turned out even better than sandwich. Maiylah, thanks. I'll see if I can find those candies here at the Asian stores. Kayni and Cheerful, I already downed two of them yesterday...they're really yummy. hi oggi - wow, so creative! i like the combo of pork menudo with a flaky crust! last week, i made picadillo and put them into puff pastry squares, so they were nice little flaky empanadas! i want to try doing that with flaked chicken or pork adobo. it would probably taste good with menudo/afritada. i cheat and use pre-made puff pastry squares though. 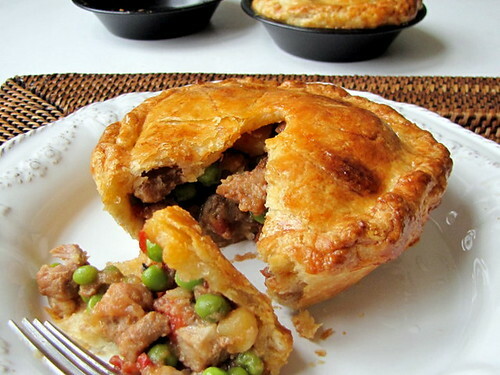 Oh very tasty savory pie, for sure! I remember back then, there's this carinderia that sells menudo sandwich, and it was really good. R, we think alike...I shredded some pork and chicken adobo and will add a wedge of boiled egg in the pie...also I've boiled pork tongue that will be made into stew afritada style which will also fill these pastries. Jenn, menudo sandwich is gooood. That looks great. My husband would love this.